Is Dak Prescott the real Willie Beamen? It was way too hot for a Sunday afternoon in mid-September in Landover. The line of people was ridiculously long. But what could Dak Prescott do? Dallas Cowboys coaches and players – heck, the equipment guys – were eager to dap up the rookie quarterback after he engineered his first fourth-quarter comeback in a 27-23 victory over the Washington Redskins. Naturally, Prescott delivered one more time. With a wet towel draped around his neck (Prescott seemed pretty cool even without it), the polished-beyond-his-experience passer remained on the field until, one by one, he gave all the well-wishers some face time. Prescott only left once the job was completed. Much to the Redskins’ disappointment, that’s the way the young fella rolled during the game, too. “You know what he showed? He showed he’s gonna be a player in this league,” said Redskins safety DeAngelo Hall, who’s in his 14th season in the NFL. From his first snap of the preseason, Prescott has displayed uncommon poise for an NFL newcomer. However, what the fourth-round pick dropped on the Redskins in Landover, Maryland, was some steal-of-the-draft stuff. The rookie drew from the same bag of tricks that the game’s top signal-callers use on the regular – freezing defensive backs with pump fakes, waiting for plays to develop, knowing when to bolt from the pocket. Prescott rushed for a touchdown, had no turnovers and was strong throughout a 292-yard passing performance, but it was his late-game work that had everyone talking. On the game’s decisive drive, the Boys down 23-20 with 10:35 left on the clock, Prescott completed four of five passes for 55 yards. That set the stage for veteran running back Alfred Morris, signed by the Cowboys in the offseason after four years with Washington, to deliver the winning score in his return to FedEx Field. It was a great day for Dallas, which since early in the 2015 season has had precious few. 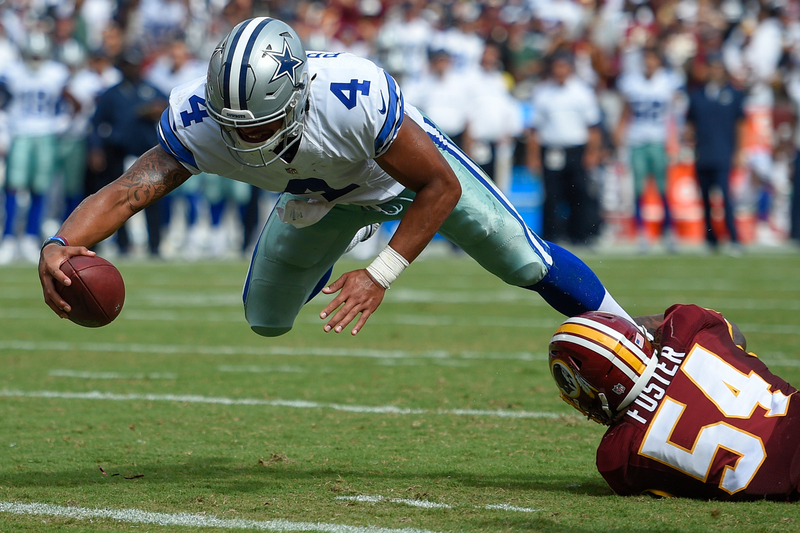 Dallas Cowboys quarterback Dak Prescott (4) dives into the end zone for a touchdown as Washington Redskins inside linebacker Mason Foster (54) hangs on during the second half of an NFL football game in Landover, Md., Sunday, Sept. 18, 2016. The Cowboys’ painful stretch – they had dropped 13 of their previous 15 games – has correlated to the pain experienced by the man Prescott replaced. Pro Bowler Tony Romo is out indefinitely (again) because of a broken bone in his back. Unlike when Romo was sidelined last season, the Cowboys now have a backup quarterback in whom they believe. And to hear the Cowboys tell it, their confidence in Prescott is growing daily. After all, what’s not to like? With the temperature at kickoff in the 80s, it was hot all day. 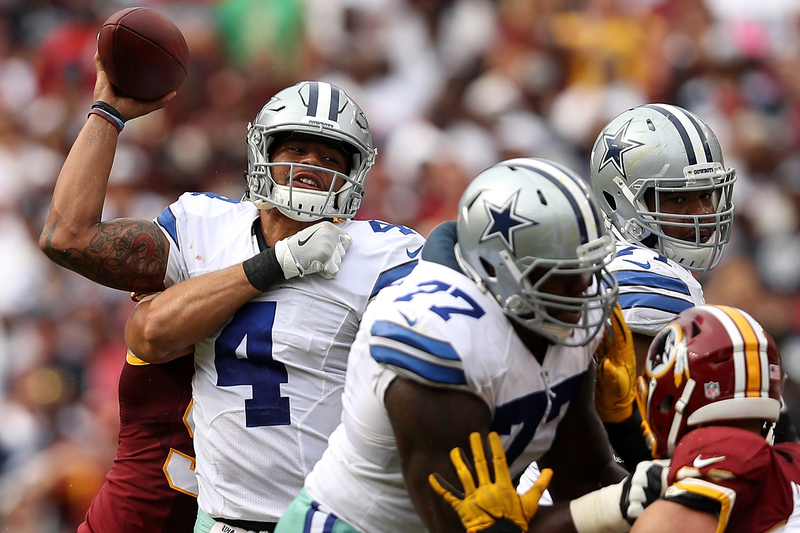 In his first road game, though, Prescott didn’t let the Redskins see him sweat. One play in the third quarter best illustrated how well he chills in the pocket. Dallas was on Washington’s six-yard line. In the shotgun on second down, Prescott cycled through his progressions, saw nothing good and took off. As he raced up the middle, Prescott made the crafty decision to look left and pump fake in the direction of Redskins defensive players. The Redskins froze. Prescott strolled into the end zone untouched. Typically, in those situations, inexperienced quarterbacks just tuck the ball under their arm and go for it. Because Prescott remained in a passing posture, Washington had to play both run and pass. That made it a breeze for Prescott to score. Prescott already is great at the mental part of the game. It all starts with his eyes, ESPN analyst Trent Dilfer said. “His eyes are the best thing,” Dilfer told The Undefeated on the phone last week. “The biggest thing for [successful] young quarterbacks is that they have a calmness and a consistency with their eyes. Their eyes aren’t ‘busy.’ They start in the right place. They see the right pictures. They don’t see ‘ghosts.’ And with Dak … he just has that calmness and consistency with his eyes. Quarterback Dak Prescott #4 of the Dallas Cowboys passes against the Washington Redskins in the fourth quarter at FedExField on September 18, 2016 in Landover, Maryland. Last week, the Cowboys’ comeback bid fell short in a loss to the New York Giants. Part of the problem was that superstar wide receiver Dez Bryant only had one reception for eight yards. In the game. On Sunday, Prescott was in sync with Bryant, who torched the Redskins for 102 yards on seven catches. That’s understandable. These are heady days for Prescott, who wasn’t supposed to be in this position. Perhaps Romo will be back soon. But who knows? What’s certain is that Prescott is thriving. As for the Cowboys, don’t be surprised if this ride lasts a whole lot longer than anyone expected. Jason Reid is the senior NFL writer at The Undefeated. He enjoys watching sports, especially any games involving his son and daughter.